The latest version of the Nissan Leaf - now made in Britain - has been improved, with lower entry-prices, an innovative battery lease deal, and an improved range on each full-charge. Nissan claims that figure has gone up from 109 to 124 miles. The controversial all-electric car has been re-priced to attract a wider audience. It's now available in three trim levels and the battery-leases are available on all models. These cars will be known as 'Flex' models, and thanks to the lease deals, entry-level pricing starts at £15,990, when the Government's £5000 plug-in grant is taken into account. 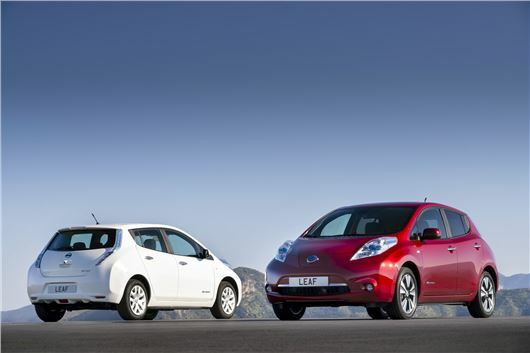 The most anyone will pay for a Leaf will be £25,490 after the plug-in grant, which will be for the up-spec Tekna version. Despite the programme of more than 100 improvements, and the improved range offered by the updated Leaf, it's the battery lease deal that moves the game forward in terms of medium- to long-term ownership costs. The separate battery lease payment ranges from just £70 per month, depending on the length of the contract and mileage covered. But the new Leaf's package of improvements are worthwhile, and come as the result of feedback from the owner's community. Along with the improvement in its range, comes an updated battery is capable of recharging in about half the time of the first-generation Leaf. The 15-mile improvement in range comes from improvements in aerodynamics and its regenerative braking system. The more important 'real world' range has also been improved with the introduction of a new interior heater, which is 70 per cent more energy efficient. New interior trim, the addition of Nissan’s 'Around View Monitor' technology and new suspension settings - specifically tailored for European roads - build on the Leaf’s unique driving experience. The arrival of the Acenta, Visia and Tekna model line-up also sees the end of the one-model-fits-all approach that previously marked-out (and possibly held back) the Leaf. Below is the pricing break-down.